The author of this textbook, the ecologist Sven Erik Jørgensen (1934–2016), made many notable contributions to ecology and ecological modelling and management. In two influential books, Fundamentals of Ecological Modelling (fourth edition, 2011) and Towards a Thermodynamic Theory for Ecological Systems (2004), Jørgensen and co-authors outlined the roles of mathematics and physical chemistry in understanding ecosystems and the impact of toxicants on the environment. Jørgensen had editorial responsibilities for the journals Ecological Complexity and Ecological Monitoring, and was editor in chief for Encyclopedia of Ecology (2008). Find and quantify all the sources of the problem. Set up a diagnosis to understand the relation between the problem and the sources. Determine all the tools needed to implement and solve the problem. Implement and integrate the selected solutions. In the subsequent fourteen chapters, Jørgensen characterises the properties and nature of pollutants, tools for modelling their environmental impact, and reviews some technological and societal solutions for environmental management. The longest chapter in the book concerns the application of the concepts of physical chemistry (essentially Gibbs’ thermodynamics) to understanding the distribution of anthropogenic chemicals in the environment. The author estimates that hundreds of thousands of chemicals participate in environmental chemistry. Their chemical properties determine their distribution in the lithosphere, hydrosphere, atmosphere, and technosphere (the technologically modified environment), and hence the environmental and health effects of these substances. Jørgensen explains the concepts of acid-base equilibria, buffer capacity, metal-ligand complex formation and stability constants, the application of Henry’s law for determining distribution between the atmosphere and hydrosphere, absorption isotherms, and redox chemistry. The author also provides fourteen worked examples to illustrate the application of these concepts. For example, how to calculate: (a) the [Ca2+] and [CO32–] content of an open freshwater system in equilibrium with solid calcium carbonate and with carbon dioxide at a defined pressure; (b) the concentration of the hydroxo species Hg(OH)+ and Hg (OH)2 in a lake of known total mercury concentration and pH. ‘Models are synthesis of all what we know – observations, theoretical knowledge, knowledge about rates and sizes, knowledge about food items etc. Models are tools to overview complex systems. The author cites from the literature seventeen examples of ecosystems which have been modelled (e.g., lakes, open sea ecosystems, mountain ecosystems, etc.) and thirteen environmental problems (e.g. eutrophication, pollution by heavy metals, global warming and climate changes). In a succeeding chapter on ecosystem health assessment (EHA), the author suggests that EHA and ecological monitoring are complementary tools in environmental management, and describes the criteria for the selection of ecological indicators for EHA and the classification of ecosystem health indicators. Environmental engineering technologies (e.g. techniques for wastewater treatment). The concept of ecological engineering – based on the work of US ecologist H. T. Odum (1924–2002) – for remediation, e.g. the construction of wetlands for the treatment of wastewater or diffuse pollution sources. ‘Cleaner production’ techniques in environmental management. This area covers environmental auditing and environmental management systems, cleaner production techniques to reduce pollution and energy use, and ‘Green Chemistry’. Identify the environmental problem both qualitatively and quantitatively. Develop a diagnosis that relates the environmental problem and its effects and consequences. Combine several toolboxes that offer solutions to the problem, to suggest a proper ecological–economical solution. 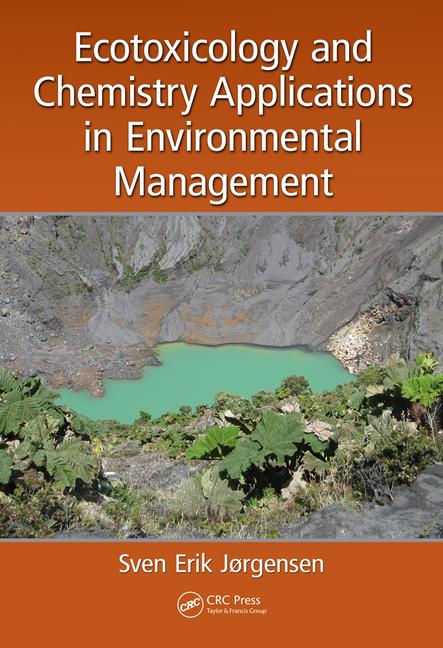 This book is highly recommended for students of environmental chemistry and should be available on the bookshelves of environmental managers. A more comprehensive Subject Index (and an Author Index) would have been welcome. Sven Erik Jørgensen, Ecotoxicology and Chemistry Applications in Environmental Management, CRC Press, Boca Raton, FL, 2016, xiii + 304 pp. Part of a series of monographs, ‘Applied Ecology and Environmental Management’, Series Editors Sven Erik Jørgensen et al. ; https://www.crcpress.com/Applied-Ecology-and-Environmental-Management/book-series/CRCAPPECOENV; accessed 25 November 2017.